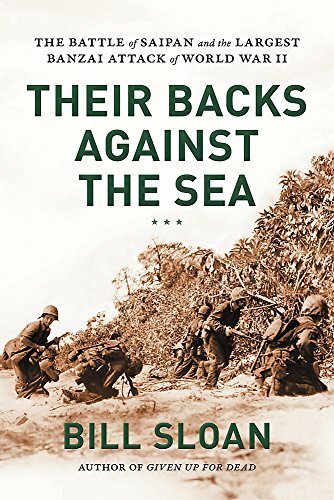 For the non-aficionado, war stories can be dry and slow reading, buried in the minutiae of fact, but Bill Sloan’s approach with Their Backs Against the Sea does not fall in that category. He has taken anecdotal material from letters, diaries, and interviews of the men who lived this event, and woven them into an account of the Battle of Saipan, 25 days that spelled the turning of events in the Pacific Theater of World War II. Each man’s contribution in his own words gives depth and color to the story. Sloan’s use of the writings and interviews of the men who experienced this battle puts a deeply personal touch on the entire book. Sloan starts the book with a prologue that introduces several of the Marines who do not wander complacently into a fight, but are thrown unceremoniously into the artillery bombardment of an island many of them had never heard of. Sloan provides an interesting history of Saipan, one of the 15 islands that comprise the Marianas archipelago. As World War II ramped up in the Pacific, Saipan’s importance to Japan’s success rose as well. By 1944 America’s role in the Pacific began to cast shadows across Japan’s plans. Yet as seen through the eyes of many of the men involved, there were several mistakes made during the invasion of Saipan. Miscalculations, erroneous landings, and in fighting among the military leaders could have spelled disaster. In 1940, President Roosevelt called the 27th Infantry Division, a National Guard unit from upstate New York, into federal service. This unit was a cohesive family that showed its importance to the war effort, “its soldiers would fight at Makin, Eniwetok, Saipan, Tinian, and Okinawa.” Sloan pulled on narratives from many of the 27th’s members to account for its activities specifically during the Saipan invasion. The chapter on this division is developed primarily from the writings and interviews of these men. It’s hard to select any one chapter of this book as the most interesting, but certainly one of those would be Chapter 5, The Marianas Turkey Shoot. This chapter is a lead-in to the Battle of Saipan, and it shows some of the flaws in Japan’s plan to confront U.S. Fifth Fleet’s Task Force 58. The result was an overwhelming defeat for Japan. While America suffered losses, the losses to the Japanese in terms of men and equipment would haunt them for the remainder of the war. Sloan addresses an internal situation that affected the American leadership in his chapter Smith vs. Smith in which he discusses the confrontation between General Holland Smith and General Ralph Smith, which ended with the removal of the latter. At issue was the appearance of lack of aggressive behavior of the 27th Divison. As the Battle of Saipan turned in favor of the Americans, the Japanese would not go quietly, and the word banzai quickly became a household word on the small island. The Japanese culture did not view surrender as an option. It was a matter of dying with honor that led the remaining Japanese soldiers to confront their death and take as many “American devils” with them as possible. Sloan’s accounting of the bonzai attacks is graphic and at times difficult to read. One of the most engaging stories of the aftermath to the invasion is from “Private First Class Guy Gabaldon, [who] single-handedly talked more than a thousand Japanese soldiers and civilians into coming out of their caves and pillboxes and surrendering.” It is stories such as this that add the personal touch to the book, making it a page-turner. This, and several other stories are longer than most, but clearly explain the final processes that were part of the Battle of Saipan. It should be noted, again, that there are some very graphic images that arise out of the stories of this aftermath. Of course, when it came to World War II, the end was not the end, and as cleanup occurred on Saipan, there was still Tinian Island, just a short trip south of Saipan, to be taken. Again, Sloan uses personal anecdotes to describe this invasion. Although this effort was completed in only seven days, the military again experienced the banzai attacks, although in much lighter doses. Sloan finishes the book not as it started—that is, not with personal anecdotes, but with gripping facts that led up to accounts of Hiroshima and Nagasaki and the end of World War II. Sloan’s epilogue pays tribute to several of the men he quotes in the book, and they are the heroes, the staff sergeants, the privates first class, the lieutenants whose experiences fly through this book with depth and poignancy. This book is well written—a real page-turner. This is a movie waiting to be filmed.